Markets go in cycles. But it seems like many moons ago since we’ve experienced a significant and sustained dip in equities. This cyclical bull market is quite long in the tooth. In fact, it is now approximately 71 months old — and the older this bullish run becomes — the greater risk lies in being late to the game and getting caught holding the bag when equities falter. For perspective, the typical duration of a cyclical bull market over the last 100 years has been approximately 40 months. We’re past due not only for a correction, but a material decline in equity prices to reset expectations before the next bull market can begin its advance. Both short-term and long-term indicators that I watch on a regular basis are pointing to the markets operating in the riskier end of the spectrum right now. One key metric I watch is the price/revenue ratio of the S&P 500. Many investors focus on earnings when evaluating the overall valuation of the market. But, as a short seller and forensic accountant, I have little confidence in the earnings that are reported because in my view they’re highly subjected to financial engineering such as buying back stock to boost earnings per share (EPS), reversing reserves, artificially lowering the tax rate, etc. While revenue can be manipulated as well, the “top-line” has far fewer variables determining its level rather than earnings. When viewing the Standard & Poor’s (S&P) 500 from the lenses of revenue, the valuations are reaching nosebleed territory. 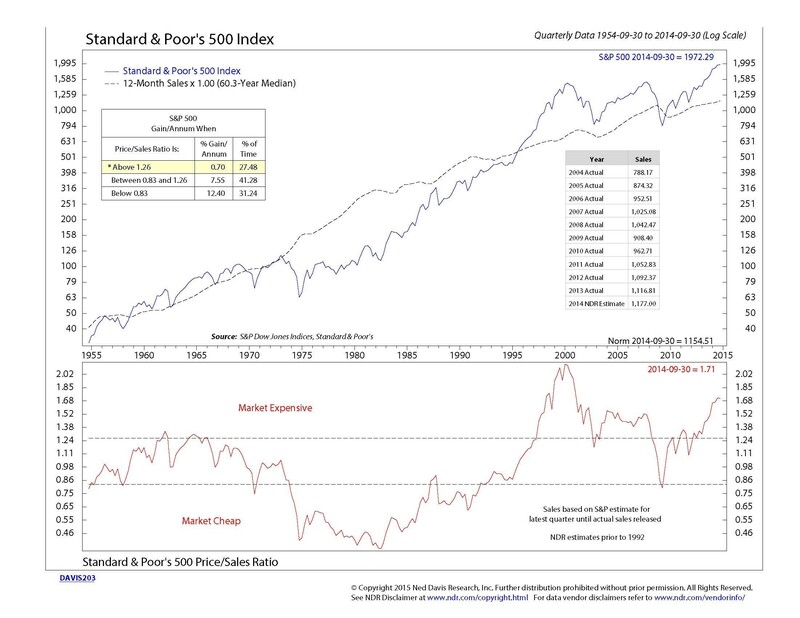 The following chart shows that aside from the Internet bubble of the late 1990’s, the price/sales ratio of the S&P 500 is at generational highs. The price/sales ratio of 1.71 which is well above historical norms. That means the market is pricing revenues at a greater level than the biggest bull market of the last 40 years that started in 1982 when many more factors were in the market’s favor. For example, during that market cycle, baby boomers were allocating to the market through 401(k) plans, companies still operating defined benefit plans which led to increased contribution to equities, real personal incomes were rising at a much faster pace, and the U.S. was more dominant globally. How high above historical norms are we? Well, the ratio is above 1.25 (the point considered “excessive”) only 28% of the time with less than 1% annual returns at that level or higher. We’re now at a level nearly 40% higher. What’s more of a concern to me is that in the late 1990’s technology stocks dominated the S&P 500. Then as the next bubble was created in housing, financial stocks dominated the S&P weighting. Today, there isn’t a sector of the market that’s a “bubble” which could be avoided. Rather, everything is overvalued here. So while technology stocks led the market lower from 2000 to 2002 and financials cratered in 2008, today everything in the market is vulnerable. This makes the market extremely risky given that there are far fewer places to hide in a coming correction and the next bear market. Therefore, investors should be cautious as to where they allocate new funds to equities. The return potential doesn’t justify the risks.